Visit the Jefferson County Museum to discover people and events that helped shape our county’s and nation’s history! The Jefferson County Museum is located in historic downtown Charles Town and shares a building with its partner organization, the Charles Town Library. Since its founding in 1965, the museum has been dedicated to fostering the understanding and love of history. The museum is committed to the acquisition, preservation, and exhibition of objects of historical value and relevance to the county and the region. Located in the eastern panhandle of West Virginia, historic Jefferson County is the northern gateway to the lovely Shenandoah Valley. Flowing along the northeastern border is the Potomac River. To the southeast are the ancient Blue Ridge Mountains and the meandering Shenandoah River, which joins the Potomac at Harpers Ferry. For millennia, until their population were decimated by European colonizers, Native Americans traversed the Shenandoah Valley engaged in hunting, trading, and warfare. 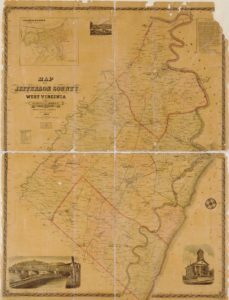 After colonization until 1863, Jefferson County was part of Virginia. In the middle of the Civil War, it became the easternmost part of the new state of West Virginia. Jefferson County’s rich history is a microcosm of the larger historical events that shaped the nation—from George Washington’s surveying here in the mid-1700s to John Brown’s Raid at Harpers Ferry through the Civil War and establishment of Storer College for freed African Americans after the Civil War to the Miners’ Trials in the 1920s.